During the last twenty years, ionic liquids have become one of the most interesting and rapidly developing areas of modern physical chemistry, technologies and engineering, including constructing new devices for various applications. In order to protect the environment and provide energy security, energy generated from renewable sources has been extensively studied. This book provides a critical review of the progress of using room temperature ionic liquids in green energy storage systems. The use of ionic liquids as electrolytes in electrochemical devices is an emergingﬁeld due to their high conductivity, as well as their thermal, chemical and electrochemical stability under anhydrous conditions. Readers will encounter five chapters in this book on recent applications of ionic liquids in supercapacitors, hydrogen production, fuel cells, Li-ion batteries, and solar cells. Also, modern trends and perspectives are discussed. 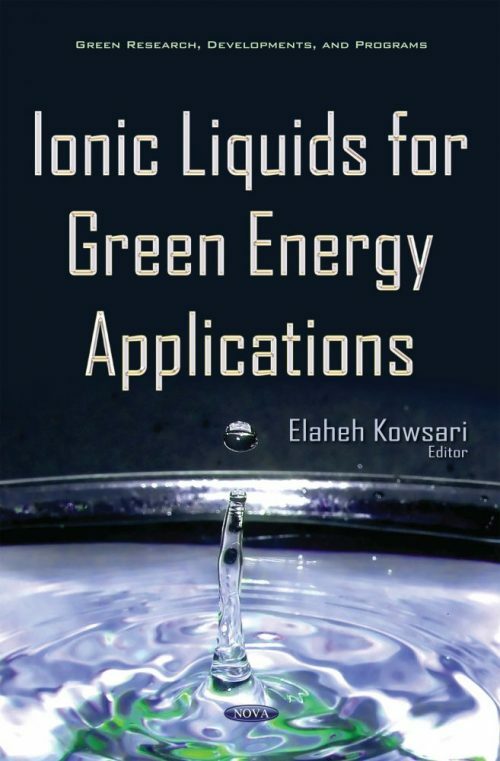 This book attempts to give a general overview of ionic liquids, identiﬁes the key factors for future research and summarizes the recent progress in the use of ionic liquids as an innovative type of energy storage systems.